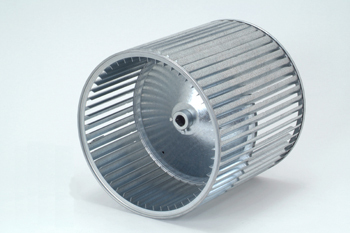 Morrison blower wheels are primarily applied to HVAC&R equipment including, but not limited to, residential furnaces, fan coils, air handlers, package and roof top units, and air terminal boxes. Forward curved double inlet, direct and belt driven wheels are fabricated from G90 galvanized steel. Available in nominal diameters of 9”, 10”, 11”, 12”, 15”, and 18″. Widths range from 4” to 18”. Direct drive wheels are available in Clockwise and Counter Clockwise rotation, with Convex or Concave centerplates and hub configurations. Available in .500″ bore, .625″ bore, and in metric bore sizes. Belt Drive Wheels are designed with two hubs, with or without keyways. In bore sizes to fit .500″, .750″, 1.00″, 1.18″, 1.43″ and 1.68″ diameter shafting. We can deliver the blower wheel you need, no matter the specifications.